Which U.S. State Wasn't Technically A State Until 2012? If you make it big in television, you might be rewarded with an Emmy Award. Make it big in the music industry, there’s the Grammy Award. Film? The Oscars. Theater? It’s an honor to win a Tony Award. Putting aside the politics of any award system, of course, the idea is that the awards go to those who have displayed exceptional merit in their respective industries and the categories covered by the awards. In the advertising industry, there’s an award just as prestigious, bestowed upon those who display exceptional creative excellence in areas related to advertising, design, and communication. It covers a broad range of subjects such as different media (print, digital, video, and so on), specific types of advertising like “Out of Home” (large scale advertisements that you see outside your home like billboards, transit advertisements, and “takeover” style ads that dominate a physical location with a theme), as well as product design, events, public relations, social media, and more. The image seen here, created by the advertising firm Ogilvy & Mather in Bangkok, Thailand, and a 2018 Gold Clio winner, is a perfect example of excellence in advertising. 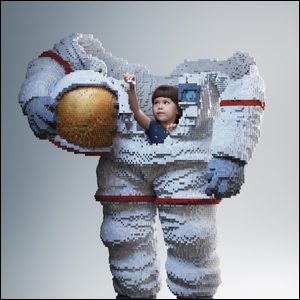 Created for a LEGO campaign, it depicts a young child building an astronaut’s suit out of LEGO blocks around their body. It’s a great idea and a beautifully executed representation of the way LEGO blocks have inspired generations of children to dream and build. Image courtesy of Asawin Tejasakulsin, Ogilvy & Mather (Behance)/Clio.